Papers of Ernest Gall, photographer, comprising index to photographs together with photographs of South Australian subjects developed from glass plate negatives. 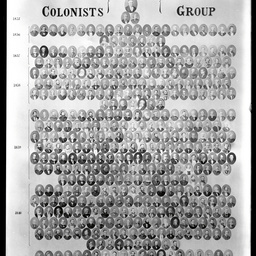 Glass plate negative of one of at least two mosaics of photographic portraits created by Adelaide photographer Henry Jones to commemorate an Old Colonists' Banquet. The banquet was organised by merchant Emanuel Solomon at the Adelaide Town Hall on 28 December 1871 to coincide with the 35th anniversary of the founding of the colony of South Australia. This image lacks the subtitle dedication 'Duplicate of one Presented to E. Solomon Esq by H. Jones, Photographer for his liberality in giving the Banquet, Decr 1871' that is included on a different version held by the State Library of South Australia at B 47769. The mosaic contains portraits of 444 men, having none of the 71 portraits added to B 47769 after its initial production. Because of this, PRG 631/3 may represent the version of the mosaic presented to Solomon before his death in October 1873. The dedication may have been removed from the bottom of the mosaic after Solomon's death. Twenty-six of the portraits show the subjects in slightly different poses than depicted in B 47769. Their clothing is identical, indicating that the different portraits were taken at the same sitting at Jones' studio. The glass plate negative has written on it '1894. This copy made by Ernest Gall'. Because this version of the mosaic duplicates many of those on B 47769, only those that are different are linked to this record. To see other pioneers, do an ARCHIVAL NUMBER search on B 47769. City buildings rooftops and horse-drawn traffic in King William Street on a damp day with the Town Hall prominent on the right. Horse trams can be seen, also cabs waiting for business in the centre of the road. In the distance King William Road leads to North Adelaide. 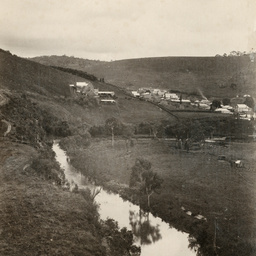 This view is part of a panorama taken by Ernest Gall from the G.P.O. Building. 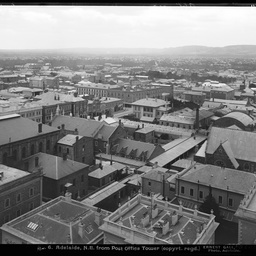 [On back of photograph] 'Adelaide looking north from the G.P.O. Tower / About 1900'. Adelaide city building rooftops give way to the distant suburbs and hills with Pirie Street cutting diagonally across the view. 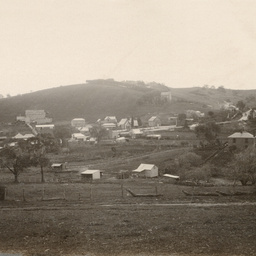 This photograph is part of a panorama taken by Ernest Gall from the G.P.O. Building. The Treasury Buildings are in the foreground. 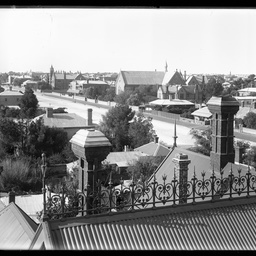 [On back of photograph] 'Adelaide / Looking north east from the G.P.O. 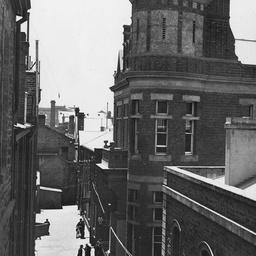 Tower / About 1900 / The City Corporation Offices, (past or present) can be seen behind the Prince Alfred Hotel / They comprise a two storey building and a one storey structure behind it'. Adelaide city rooftops merge into the distant parklands and suburbs beyond. Waymouth Street cuts diagonally through the middle of the view. This photograph is part of a panorama taken by Ernest Gall from the G.P.O. Building. 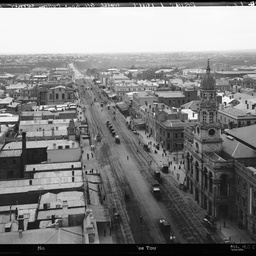 [On back of photograph] 'Adelaide looking north west from the G.P.O. Tower / About 1900'. Sweeping view of city buildings' rooftops stretching out towards distant south parklands and southern hills beyond. Victoria Square is in the foreground (note the National Mutual Life building, G.E. 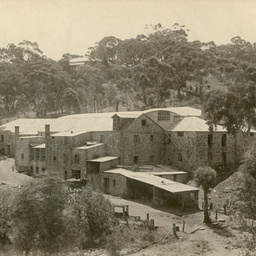 Morgan's monumental mason's yard, Morialta Chambers, the Windsor Castle Hotel (Licensee G. Lee). 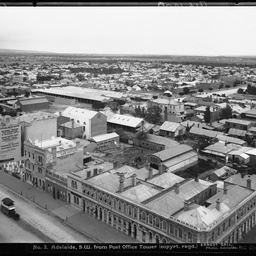 The Adelaide Central Market is in Grote Street (centre left) and the dark patch above the markets is Whitmore Square. 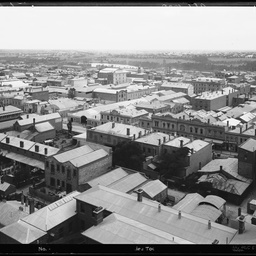 [On back of photograph] 'Adelaide / Looking south west from the G.P.O. 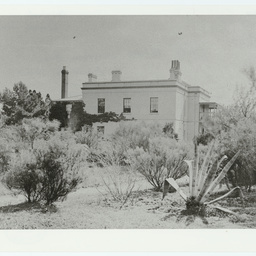 Tower / About 1900', looking towards This photograph is part of a panorama taken by Ernest Gall from the G.P.O. Building. 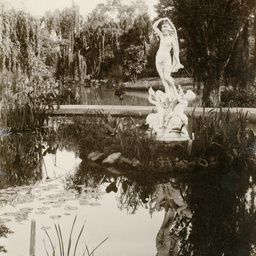 Photographs by Ernest Gall of scenes within both the Adelaide Botanic Gardens and the Adelaide Zoo. 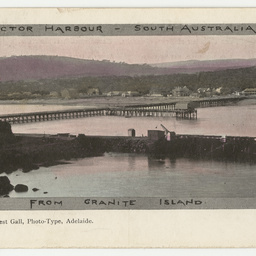 Tinted postcard which shows a distant view of Victor Harbour [Harbor] taken from Granite Island. Shows the causeway and jetties. A message is written on the back of the postcard. Photographs of South Australian subjects, taken by photographer Ernest Gall, and developed from glass plate negatives. 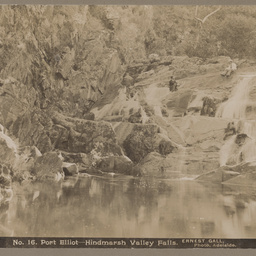 Black and white photograph of two men sitting on rocks of the Hindmarsh Valley Falls near Victor Harbor. 'No.16. Port Elliot' by Ernest Gall. 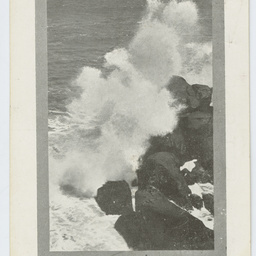 View of waves crashing on the rocks at Granite Island, with the caption "Girt by the Southern Sea". 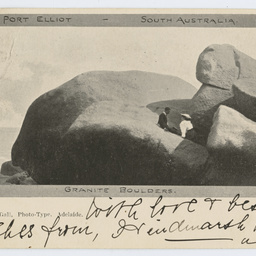 A couple sitting in franite boulders at Port Elliot. Jeffcott Street looking north, about 1900. Near side of house on extreme right (on east side of Jeffcott St) is 210 yards south of Ward Street. Christ Church can be seen in the middle of the photograph. Bishop Augustus Short initiated the building of Christ Church North Adelaide in 1848 and the building was consecrated in 1849. In 1852 the Rectory was built next door to the church. Exchange Place looking north. In the foreground, running off to the right is McHenry Street. The tall building in the centre is the Stock Exchange. Businesses south of the Stock Exchange building include Theo Bruce and Company auctioneers. At number 22 stands Ernest Benda the tobacconist. Next door stands George C Twiss shareboker. Several pedestrians are walking along Exchange Place, all are wearing hats. The Stock Exchange was designed by HE Fuller and Hedley A Dunn is built in the style of Federation and Edwardian buildings. The Adelaide Oval, during a cricket match: England versus South Australia, 30th October, 1897. The visiting English side was captained by AE Stoddart and Lyons captained the South Australian side. Ernest Jones for SA was no-balled in the match. 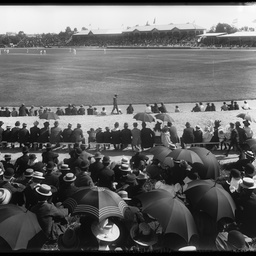 The photograph shows the crowds, some sitting under sun umbrellas and the grandstands which dominate in the Oval. 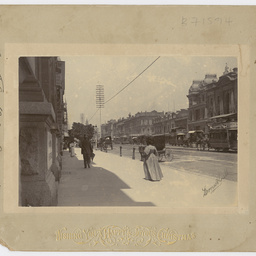 Corner of King William Street and North Terrace. 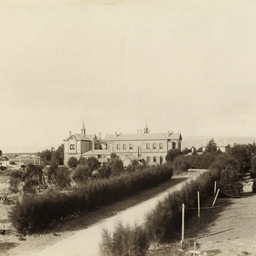 ACRE 17: Photograph by Ernest Gall Studio. 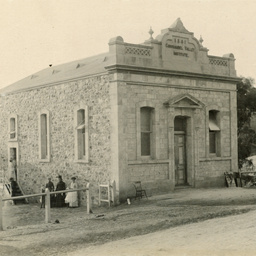 The image is situated on the corner of King William Street and North Terrace with the view looking towards the the General Post Office on King William Street. 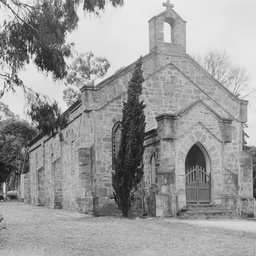 [General description] This stone church was consecrated in 1848, built on land bought for the purpose by George Morphett and Samuel Stocks from McFarlane in 1843. It has a bell tower which was added at a later date. Part of the graveyard can e seen on the right. [On back of photograph] 'St James Anglican Church, Blakiston / 1895'. Blind, Deaf and Dumb Institution Brighton. Set amongst the dunes at Brighton, this Institution was founded by William Townsend, MP, in 1874. 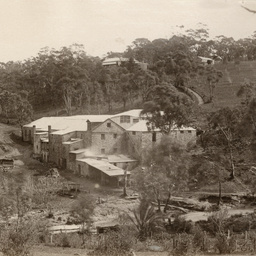 [General description] This view shows a panoramic view of the mine and surrounds with the engine house in the centre. A bullock team can be seen on the left. [On back of photograph] 'Burra / 1850 / From S.T. Gill's water colour sketch' (Another hand) 'Not the same as in the Art Gallery'. Panoramic view of Clarendon, facing west. The Onkaparinga River at Clarendon, facing east. 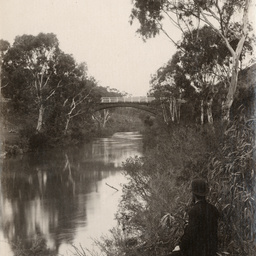 The bridge over the Onkaparinga River at Clarendon. In the foreground a man sits on the river bank and admires the view. This is the original bridge, built in 1858 from laminated redgum. 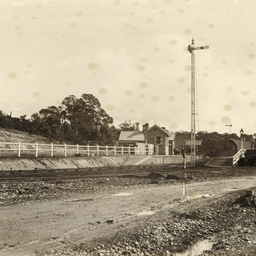 It was later replaced by a concrete bridge in 1919. 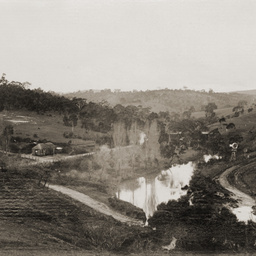 Panoramic view of Clarendon with the Onkaparinga River in the foreground. 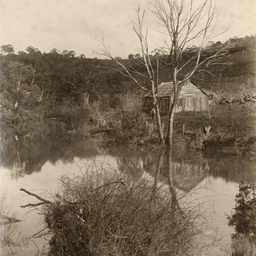 Cabin cottage at Clarendon, reflected in the water of the Onkaparinga River. It is constructed of timber and has a shingle roof. 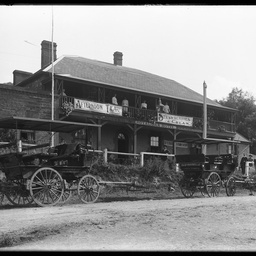 [General description] Staff and patrons pose for this photograph of the Royal Oak Hotel. It is a two storey stone building with a wide verandah and balcony over which hang banners advertising their 'Afternoon teas: Strawberries and Cream'. Three empty horse-drawn vehicles stand in the foreground. [On back of photograph] 'Royal Oak Hotel at Clarendon / 1910'. [On back of photograph] 'Murrays Biscuit Factory Coromandel Valley' [General description] An extensive complex of stone buildings is set amongst trees on a hillside. Alexander Murray, who arrived on the 'India' in 1840 founded the business, which manufactured both jam and biscuits, later to become Alexander Murray and Son. It thrived and employed many local people but eventually closed in 1900. Murrays Biscuit Factory, built by Alexander Murray. He arrived on the India in 1840, planted fruit trees, built a jam and biscuit factory and employed many of the local men and women. 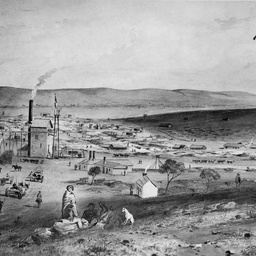 Some women even walked from Hahndorf once a week to work at the factory. Eventually it became A. Murray and Son and operated successfully until the turn of the century. The Institute, built in 1881. A group of ladies stands outside. Livingstone House, built by Verco.